UV Connection is a global leader in UV curing technology. 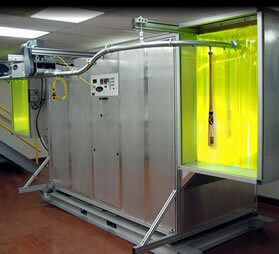 We manufacture state-of-the-art ultraviolet curing systems. In the ultraviolet curing process, special chemicals called photoinitiators are added to coatings, adhesives and inks. When these chemicals react with specific wavelengths of ultraviolet light, molecular cross linking occurs. This creates an extremely durable finish, superior adhesion and a better product. Click here for more curing information.